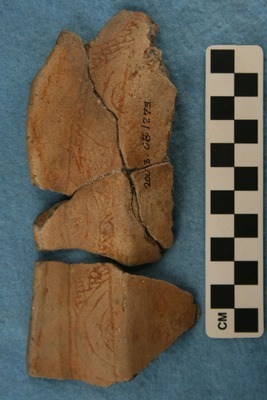 "Vessel 28, Burial 5, 2003.08.1273" by Timothy K. Perttula and Robert Z. Selden Jr.
DECORATION (INCLUDING MOTIF AND ELEMENTS WHEN APPARENT): The upper rim panel is plain. The lower rim panel has opposed sets of concentric semi-circles (possible eight in number) outlined by a cross-hatched meandering scroll. The sets of concentric semi-circles have small semi-circles at either their top or bottom, and the smallest concentric circle is either cross-hatched or plain. Avery Engraved, var. unspecified compound bowl, Vessel 28, Burial 5.